Posted by Dave Emory ⋅ December 18, 2018Post a comment Email This Post Print This Post Tweet This! Introduction: This is the ninth of a planned long series of interviews with Jim DiEugenio about his triumphal analysis of President Kennedy’s assassination and New Orleans District Attorney Jim Garrison’s heroic investigation of the killing. His work with a Civil Air Patrol unit that included Lee Harvey Oswald, as well as Barry Seal, another future CIA operative who became a major player in the Iran-Contra drug traffic. Ferrie’s CAP unit’s profound relationship with the military, permitting his unit to operate at Keesler Air Force Base in Mississippi and to fly on military aircraft. This indicates strong gravitas on Ferrie’s part within the national security establishment. His strange trip to Texas on the day of the assassination, driving all night through a heavy rainstorm to–take your pick–go ice skating and/or go goose hunting. The manager of the skating rink stated that Ferrie did not go ice skating but stayed by a pay phone all of the time he spent there. His companions stated that they did not bring guns on the trip. Ferrie spent his time in Galveston (a Texas port city) in a hotel overlooking the sea. Ferrie marketing his untenable ice skating/goose hunting story to the FBI–an act of perjury on his part. Ferrie also stated that he didn’t know how to fire a rifle, a claim fundamentally at odds with Ferrie’s work as a paramilitary commando trainer at the CIA camps at LaCombe, Louisiana. Immediately after the assassination, Ferrie frantically sought to recover any photographs of him with Lee Harvey Oswald in his CAP unit. Immediately after the assassination, Ferrie worried that his library card might be in Oswald’s possession. Oswald knew about “microdots,” a technique developed by German intelligence in World War II permitting the reduction of an intelligence communication to microscopic size, thus enabling its insertion into a period or comma in a sentence. Some researchers have opined that the library card may have involved some use of microdot technology in the Ferrie/Oswald intelligence relationship. 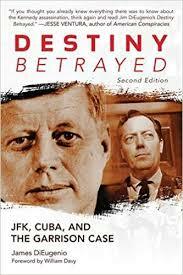 Ferrie, Oswald and Guy Banister were all deeply involved with the CIA’s anti-Castro Cuban effort in New Orleans. Banister’s office was a front for many of the weapons used by Ferrie and company at the LaCombe camp and other facilities. As discussed previously, Oswald’s one man Fair Play For Cuba Committee (New Orleans chapter) was housed in the same Newman building that housed Banister’s operation. Ferrie had operational connections with both Eladio Del Valle and Sergio Arcacha Smith, two of the CIA’s primary anti-Castro Cuban operatives. Against the background of JFK’s Cuban policy, including JFK’s actions vis a vis the Bay of Pigs, the Cuban Missile Crisis, his impending diplomatic rapprochement with Castro and the Justice Department’s closing down of the LaCombe camp and others like it, Ferrie began making increasingly violent statements about JFK. Ferrie began openly talking about killing Kennedy. His violent anti-JFK statements were one of the reasons he was dismissed from Eastern Airlines, for whom he worked as a pilot. If his death was natural, why were there two typed suicide notes? If it was suicide, how did he die? There were marks in Ferrie’s mouth, clearly revealed in autopsy photos. Might they have indicated that drugs been forced down his throat? Ferrie had been taking proloid, which might well have produced the lethal reaction Ferrie experienced in the event of an overdose. He had ordered thyroid pills, which were gone when his body was discovered. Journalist George Lardner had interviewed Ferrie, and claims he was with Ferrie until 4am, the last possible time that Ferrie’s death could have occurred. If Lardner was right, the killers must have entered within minutes of his departure. Decades later, Lardner, working for the CIA-linked Washington Post, went to Dallas to shadow Oliver Stone’s filming of “JFK,” based on Garrison’s book On the Trail of the Assassins. Lardner then wrote a hit piece on Stone’s film before it was released.